If you're like me, you're always doing recon for new gear that can help you up your game at the grill. Here are 10 accessories that have caught my eye recently: great just got a lot better. 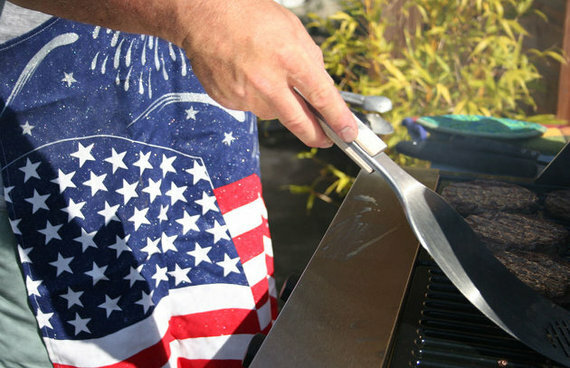 It's almost July 4th -- traditionally the busiest grilling date of the year. Not that this community hasn't been firing it up for months now. Hell, a lot of us (even in the Frost Belt) 24/7/365. If you're like me, you're always doing recon for new gear that can help you up your game at the grill. Here are 10 accessories that have caught my eye recently: great just got a lot better. A-maze-n Tube Smoker: This steel mesh tube looks deceptively simple, but when you load it with wood pellets or sawdust, this 12-inch perforated stainless steel tube puts out fragrant wood smoke for up to 4 hours. (Of course, it can be refilled for longer barbecue sessions.) You can even use it to cold smoke cheese, nuts, or jerky. Bear Paw Meat Handler Forks: Maneuvering a whole prime rib, ham, or barbecued turkey from grill to cutting board can be a tricky. Improve your grip on any huge hunk o' protein with this pair of insulated meat handlers, which really do look like bear paws. Make quick work of reducing a whole pork shoulder to smoky meaty shreds. Masterbuilt Electric Smoker: When it comes to smokers, normally I adhere to the no- guts-no-glory school. I heard such good buzz about the reasonably priced Masterbuilt Electric Smoker, we decided to test-drive one at this year's BBQ University. This insulated upright smoker burns real wood chips, not pellets, and has digital time and temperature controls and 730 inches of cooking space. You do little more than set it and forget it. A big thumbs up from all of us. GrillGrates: These anodized aluminum grill grates (they fit right on top of your regular grill grate) solve three problems at once: They not only prevent flare-ups, but encourage even heat distribution and create those "killer grill marks" I'm always championing. Conveniently, they can be bought in sections depending on the size of your grill. Compatible with gas, charcoal, or pellet grills. Ivation Long Range Wireless Remote Meat Thermometer: One of my Ten Commandments of Perfect Grilling is never desert your post. But that doesn't mean you have to babysit your brisket for 12 hours. Not if you have a programmable remote meat thermometer on your team. The Ivation unit can monitor meat temperatures up to 300 feet away, and will alert you when a preset temperature is reached. Brazilian-Style BBQ Skewers: Skewered spit-roasted meats are a religion in Brazil. Perhaps you've visited one of their "temples," also known as churrascarias, for a belt-busting carnivorous bacchanal. These awesome skewers mean business, with a 1-inch wide blade to support large chunks of meat (and keep them from spinning) and riveted wooden handles to keep your hands cool as you serve the meat, gaucho-style. BBQ Grill Mats: We've all watched asparagus spears, mushrooms, or shrimp fall through the grill grates. Minimize sacrifices to the grill gods with these handy grill mats (think safety net for small foods). And take up a lot less space than a traditional vegetable grilling basket. You can even use the Grill Mat to roll up bacon explosions or meatloaf (secure with butcher's string to maintain shape). Or use for grilling fragile fish fillets, like fluke or pike. These nonstick mats come two to a package and are dishwasher safe.